I use the descriptor ‘failure’ in a selective way, although it is probably the meaning that that vast majority of citizens would ascribe to the term. In this context, I’m thinking that successful policy improves the lives of the most disadvantaged citizens in a region. A small minority of people might think of success in terms of how rich the top end of the distribution becomes (in wealth or income). Yesterday (January 25, 2016), a UK research group, the Centre for Cities released their latest – Cities Outlook 2016 – which is a comprehensive analysis of how the larger cities in Britain are performing across a variety of indicators. In this release, the theme was centred on the claim by the British Chancellor that his policy design was intending to produce a “higher wage, low-welfare economy in Britain”. The report suggests the British government has failed and that “almost half of lower wages, and higher welfare, than the national average” and “welfare spending since 2010 has grown at a much faster rate in high-wage cities”. I’ve also been trying to disentangle the impacts of deindustrialisation on urban spaces, which began in the 1980s, from the more recent impacts of policy austerity, driven by misguided understandings of the capacities of currency-issuing governments. I want to address the claim from the Left, that the shifting patterns of capitalist production across regional spaces, is inevitable and undermines the capacity of cities to prosper. The shifting patterns might be inevitable but the conclusion that is drawn about the options available to cities are largely incorrect. The Centre for Cities Report is very interesting and worth reading. It studied the 63 largest cities in the UK, which “account for 54 percent of the population, but generate 63 per cent of all wages in Britain”. 1. 29 cities were considered to be low-wage, high-welfare economies (many in the North). 2. 18 cities were considered to be low-wage, low-welfare economies. 4. One city (Southend) was considered to be high-wage, high-welfare. The following map is taken from Figure 4 of the Report and shows the distribution of the cities by category. 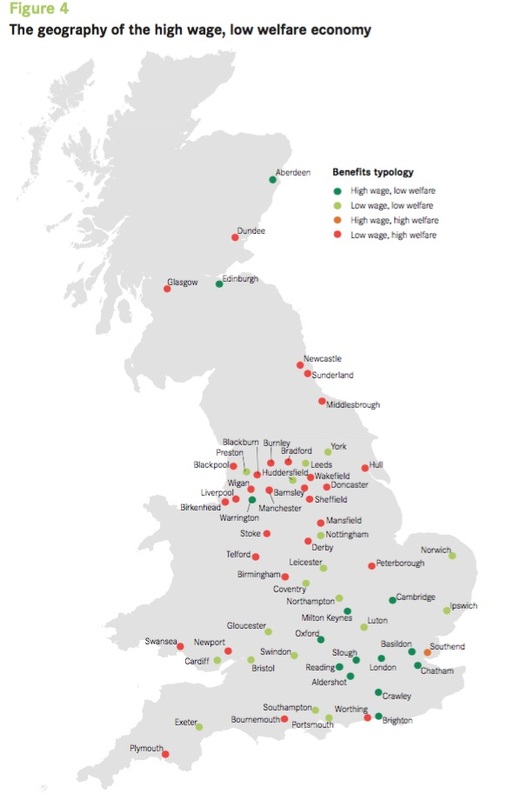 It shows that Britain continues to be plagued by a substantial north-south division where cities in the North are typically low-wage, high-welfare economies with deficient educational outcomes, poor housing and a lack of jobs. The division both geographically and by levels of prosperity is driven by the distribution of employment (including the location of certain industries), the levels of education and skills (which tend to follow the pattern of employment) and the patterns of welfare spending on behalf of government. Between 2010 and 2014, real wages have fallen by 5 per cent in Britain. These declines have been spread more or less evenly over the types of city economies, although the high-wage, low-welfare cities have endured a six per cent real wage decline, compared to a four per cent decline elsewhere. The Report estimates that in “2014, there were over 1 million more jobs in Britain than in 2010”, yet this strengthening demand for labour has not been accompanied by rising wage pressure. 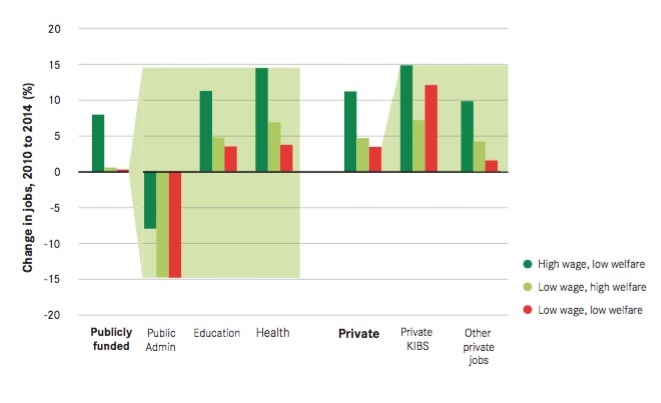 The Report produced the following graph, which shows the change in employment (public and private) between 2010 and 2014 across the four types of cities noted above. It is fairly obvious what has been going on. The attack on public employment by the current Conservative government has impacted more harshly on the low-wage economies in Britain. Further, the gains in private employment have been biased against the low-wage, high welfare cities. Around one in three net new private sector jobs created in high wage, low welfare cities has been in knowledge intensive business services (KIBS), which tend to be higher skilled, better paid jobs. In the low wage cities that have high welfare spending, this figure was one in four. Spending on benefits in Britain has risen sharply in recent years. Between 2004/05 and 2010/11, real benefit spending increased by 24 per cent. But the geography of this is surprising – it was the cities with the lowest benefit spend at the start of this period, rather than the highest, which saw the largest increases. One explanation for the buyers it increased well for spreading towards high-wage cities is the “larger increases in housing benefit spend” as a result of increasing lack of affordable housing in those cities. There are two reasons for this phenomenon, one outlined in the report, and the other a frequent message from my blogs on Britain. First, there are housing shortages not the least due to a lack of investment by the government in adequate public housing. Second, the Government’s strategy is to reduce its own net spending and rely on increased household spending driven by credit growth to maintain growth, given the appalling performance of private investment spending over the last several years. The focus of this household spending is increasingly in housing speculation, which is driving up prices and reducing the stock of affordable housing. The high-wage cities are also experiencing stronger population growth, which is exacerbating the problem. Both these factors are the result of poorly constructed economic policy. Austerity has unintended consequences, which sometimes do not reveal themselves for some years and by then the political debate has moved on. This is particularly the case in areas of state housing where the lack of affordability creeps up until it becomes a major issue. I would guess that nobody within the British government has done a sensible cost-benefit analysis of the investment outlays required to provide adequate state housing relative to the growth in housing benefit payments necessitated by the lack of such housing provision. Austerity is mired in myopia. The Centre for Cities Report argues that the difficult situation faced by the low-wage, high-welfare cities demonstrates that attempted cuts in welfare payments do not generate sensible outcomes. They can attempt to bring down welfare spending directly through the spending decisions they take – the intention is to reduce total welfare spending by £12 billion by 2020 – but ultimately, the size of the welfare bill and the performance of the economy are interlinked. 1. Increased public investment in education and skill development. 2. Devolution of national funding to city authorities to allow them to meet the demands of their local populations. The problem with the report is that it still emphasises the supply-side of the economy (for example, skill development) at the expense of stimulating the demand-side (that is, the growth in jobs). In their rush to create justifications for reducing the footprint of government on the economy (and society), economists invented a number of new ‘approaches’ to economic development, unemployment and poverty which rely on an increased private sector presence. New regionalism became popular as part of the so-called Third Way movement in Britain and Europe in the 1990s and beyond. Concepts such as social entrepreneurship and new regionalism emerged as the governments embraced the so-called ‘Third Way’ – neither free market (right) or government regulation (left) – as a way to resolve unemployment and regional disadvantage. The Third Way movement included new ideas about space – that is, the global, national and local regional layers which still rely on individualistic and market-based constructs inherent in neo-liberalism. Unemployent is still rendered as an individual problem – the ultimate ‘privatisation’. The interlinked ideas that define this approach to ‘spac’ are consistent with the oft-heard claim from neo-liberals that the ‘national’ level of government is now getting in the way of development. It is highly disputable whether the empirical examples advanced to justify the claims made by New Regionalist proponents actually represent valid evidence at all. It is a different spin (a variation) on the “business cycle is dead” notion and amounts to a denial that macroeconomic policy – that is, at the national level – can be an effective response to global trends that penetrate via the supply chains defined by trade patterns to the local region. This is the trap that the Centre for Cities Report falls into. Modern Monetary Theory (MMT) provides us with a way of understanding that currency-issuing monopoly embedded in the national state is still powerful and can be used to advance domestic prosperity independent of the way in which global changes manifest. That is not to say that these major changes in supply chains and changes in the pattern of energy demand etc are not major events which are forcing national economies to adapt. That clearly is the case and I have written about it at length. But even with the pressure of these changes, the national state remains relevant. The reason why mass unemployment occurs hasn’t changed as a result of globalisation. It still remains that if aggregate spending is not sufficient to purchase the total supply of goods and services, there will be an unplanned increase in inventories leading to a rise in unemployment and/or underemployment. To avoid this situation, net government spending (the fiscal deficit) must fill the spending gap. So mass unemployment always reflects a choice made by government to provide lower net government spending and accept higher unemployment. When involuntary unemployment exists, nominal (or real) wage cuts cannot ‘clear’ the labour market unless they somehow eliminate the desire of the private sector to net save, and thereby increase its overall spending in the economy. That is, of-course, unlikely in the extreme. The opposite is highly probably. Furthermore, individual search endeavour or improving skills cannot eliminate the macroeconomic constraint imposed on the labour market. In other words, the unemployed cannot search for jobs that are not there. Extending the model to include the foreign sector makes no fundamental difference to the analysis, because private domestic and foreign sectors can be consolidated into the non-government sector without loss of analytical insight. Only government deficit spending can accommodate any net desire to save overall by the non-government sector and eliminate unemployment. In contradiction to mainstream rhetoric, the systematic pursuit of government fiscal surpluses must be manifested as systematic declines in non-government sector savings. Mass unemployment thus arises because the fiscal deficit is too small, whatever global forces are operating to shift the pattern of production between nations. The non-government sector depends on government to provide funds for both its desired net savings, and for payment of taxes. To acquire the currency it needs, the private sector offers real goods and services for sale. Unemployment therefore occurs when net government spending is too low to accommodate the need to pay taxes and the desire to net save. In general, given that the non-government sector desires to hold currency, deficit spending will be the norm if high levels of employment are to be maintained. As long as the national government can enforce tax obligations in the currency it issues then these conclusions will hold. Globalisation might shift tax bases off-shore if government regulation permits. But ultimately, military invasions aside, the national government maintains the capacity to determine the regulative and policy environment that global businesses have to operate within. Global businesses do not sell at some abstract global level – they sell to you and I in our local shops (predominantly – that is, notwithstanding the rising proportion of on-line shopping). Even as on-line shopping becomes more commonplace, the goods and services will still have to cross national borders. Irrespective of globalisation, there are no financial constraints on a national, currency-issuing government spending. It still remains, no matter how integrated economies are globally, that the currency-issuing government’s spending provides the non-government sector with the currency they need to discharge their tax liabilities and to net save. This spending precedes the tax payments and logically cannot be financed by the same. If the private sector desires to net save then total government spending must exceed taxation; therefore, there must be a fiscal deficit. Fiscal surpluses thus squeeze the desires of the private sector to hold financial assets, net save and pay taxes. Ultimately, they must lead to mass unemployment due to insufficient spending. And then we arrive in Flint, Michigan. Distressed cities – centres of the shifting production frontiers of capitalism, the de-industrialisation and, more latterly, the short-sighted belligerence of conservative public officials intent on driving the aspirations of citizens throughout the urban space into despair, as long as it is not themselves or their families and friends. When we think of distressed cities we have images of abandoned buildings and big factories closing. Flint, Michigan was the homeof the Buick Motor Car company, which moved there in 1903. It was soon taken over by General Motors, which began production there in 1908. Its population peaked around 1960 at 196,940 persons (according to the US Decennial Census). A large proportion of the population worked at GM. In 1978, the GM factory employed around 80,000 people in Flint. Flint might be cast in the role of creating the American middle class with stable, well-paid full-time employment and the material prosperity that went with that. And then the shocks came. First, it was the industrial shifts which devastated Michigan as a result of its concentration of motor vehicle production employment. In the 1980s and 1990s, GM abandoned Flint. By 2006, GM employment only 8,000 people in Flint. By December 2010, the last of the employees were laid off at the old Buick site. Flint, Michigan shows once again the myopia of fiscal austerity and its problems go beyond those introduced by the relocation of GM. It is true that its industrial base is largely gone as global supply chains have shifted motor vehicle production, assembly operations. Its population base has also shrunk quite dramatically. The following graph shows the population of Flint since the decennial census in 1940 and annual observations after 2000. The impacts of the deindustrialisation is clear but then some stability are merged in the early 2000’s as the worst of the industrial wipeout was absorbed. In fact employment started growing again in the year 2000 and was relatively stable until 2007. The unemployment rate which was 12 per cent in 1992 at the height of the factory closures fell to 5 per cent in the year 2000, partly due to shrinkage in the labour force but also due to growth in employment. In 2009, Flint’s unemployment rate was 15 per cent having nearly doubled in two years. By 2010, Flint’s unemployment rate had risen to 23.2 per cent. 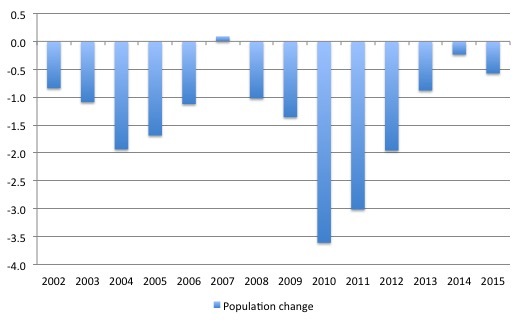 The population decline exhilarated in 2009 as a result of the GFC and the subsequent policy austerity that the Michigan State government imposed. 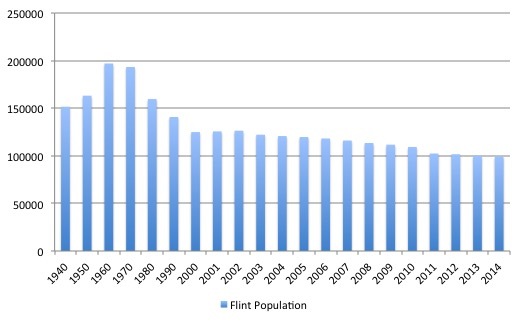 The following graph shows the population change in Flint between 2002 and 2015. The population in 2014 was 99,166 and some forecasts are suggesting that by 2040 the population will be down to 65,000. The decline clearly is in two stages: (a) the impact of the deindustrialisation; and (b) the impact of the policy austerity. The Governor of the State of Michigan has been engaged in a fiscal war on the citizens of his State and of Flint, in particular. The Michigan Muncipal League, which is “dedicated to making Michigan’s communities better”, has documented the Revenue Sharing Heist in Michigan under the current Governor. … a record number of local governments that find themselves in the midst of a financial crisis … [as a] … esult of a dramatic disinvestment by the state in local government. Certainly, lower property values have impacted on local government revenue in Flint. But the “dramatic reduction in state revenue sharing”, which is “paid from sales tax revenues … have been a remarkably stable source of income” for States. In “recent years”, this source of revenue for states has experienced significant growth”. … statutory revenue sharing declined from over $900 million annually to around $250 million. The state is now in an enviable position—revenues that exceeded expectations. It is posting large surpluses but has failed to take steps to restore local funding. … the state is trumpeting its sound fiscal management and admonishing local governments for not being as efficient. What the state fails to mention is that it balanced its own budget on the backs of local communities … What is most shocking is the difference those revenue sharing dollars would have made at the local level … Flint will have lost $54.9 million dollars by the end of 2014. The deficit in its 2012 financial statements is $19.2 million. Flint could eliminate the deficit and pay off all $30 million of bonded indebtedness and still have over $5 million in surplus. The revenue-sharing formula was altered by the Governor Snyder in 2010 and he implemented a sort of deal the Troika in Europe would be proud of. Cities get money if they implement “free market reforms” to reduce the public intervention and provision. The cities were forced to cut health care staff, educational expenses, police etc. One of the consequences of the harsh fiscal cutbacks in Flint has been the disastrous water crisis. You will find a good analysis of the water crisis in Flint in this article (January 22, 2016) – Flint’s Water Crisis Is No Accident. It’s the Result of Years of Devastating Free-Market Reforms. This reference provides a – TIMELINE: Here’s how the Flint water crisis unfolded . Studies of the quality of the local water “pointed to widespread lead contamination”, which the citizens had complained about. The Michigan state is essentially poisoning the citizens of Flint in the name of ‘free market’ reforms. The other obvious consequence of the fiscal cuts has been in the crime rate. The US Federal Bureau of Investigation produces excellent annual – Crime Statistics for the US by City – which I have used here. The following graph shows thenumber of police officers per 100,000 persons in Flint since 2001. The decline in 2009 was 22.6 per cent, which was followed by a further 39.5 per cent cut in 2010. 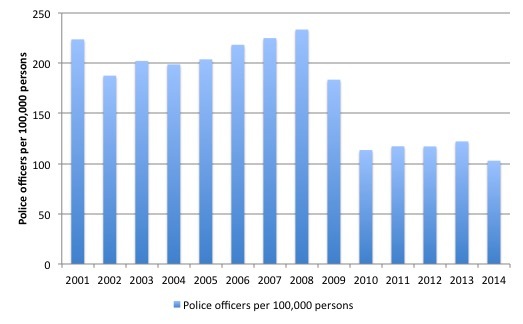 As the number of police were cut, the crime rate increased sharply. Flint was classified as the most violent city in AMerica in 2010 using FBI statistics. I will write more about the urban aspects of austerity in future blogs. I discussed the work of French writer Viviane Forrester in this blog – L’horreur economique. In her 1996 book called L’horreur Economique, Forrester proposes that governments are failing to generate enough employment but at the same time they are promoting a backlash against those who are jobless. So when the unemployed also become aged – what then? What about Flint, Michigan? What purpose does it serve the capitalist machine now that car manufacturing has gone? We have allowed the Flint, Michigan’s to decline and become a human catastrophe due to a lack of imagination and a passive acceptance of faux financial arguments about the capacity of our governments. We learn to recite that “the government cannot afford to create jobs for all the unemployed” when the opposite is the truth. We are conditioned to believe that there is nothing that these workforces can do that is productive, which is a lie, but diverts the debate into a series of non-sequiturs. If the unemployed are ultimately dispensable for capitalist production (and that is what persistent long-term unemployment suggests); and they cannot do anything productive if we employ them in the public sector (that is the overwhelming view of the deficit terrorists); and they are a nuisance to manage (you know all the arguments – income support corrupts etc) – then ultimately society might start asking “what is the point of the unemployed?”. You may reach all the Coles Catalogues. Then different solutions might be advanced. Don’t think this is off the track … after all only 80 odd years ago Germany decided that a definable cohort was dispensable and could be exterminated. L’horreur Economique is one of those books that you just go back to from time to time to remind yourself of the message – just in case you have moved on to the vilification of the aged and left the unemployed behind. Any such ‘Regionalist’ policy is impotent without a strong element of location taxation. i.e. land value taxation. Otherwise is it just an open door for rentierism. The adult population went up by 1.436 million in the same period. That’s about the employment rate in ratio terms, so the demand/supply pressure has remained roughly the same. Yes, but the regional shifts have been interesting as per the Report. When I hear the objections to the Job Guarantee I have never yet heard a counter argument that the state pension age should simply be dropped to, say, 50. After all if you have the arguments that says work happens spontaneously, then you should have the arguments to counter the demographic arguments that is pushing the state pension age ever upwards. And it is much easier to justify 50 year olds getting state funds since it deals with the ‘have they earned it’ objection fairly directly. Plus there is quite a bit of evidence that older people have a hard time finding jobs – often harder than the young. And the state pension isn’t seen as ‘welfare’ by the right. Here in the UK the boost from retirees drawing down old-style final salary pensions during the GFC seems to have helped keep the system ticking over. So adding to that with a boosted state pension ought to help distribute state money further around the country and perhaps start to move the country forward. A Job Guarantee would be better – since it allows a higher income at a lower tax rate with production protection built in. But perhaps a lower state retirement age should be considered as well? Absolutely. I’m sat in the middle of it here. Not so much Northern Powerhouse as Northern Poorhouse. In case one doesn’t read French with any facility, there is an account of the poor in England published in 1997. It is Dark Heart: The Shocking Truth About Hidden Britain by Nick Davies, an investigative journalist. His accounts, an instance of participant observation research, are harrowing, indeed, awful. The emotional consequence of reading his account might well be deep sadness that anything like he describes should be taking place in the UK today. Should anyone think that Davies’ account might be out of date, please think again. A more recent work, published in 2014, is Hack Attack: How the Truth Caught Up with Rupert Murdoch. It did, and nothing seems to have changed. Cameron has met with Murdoch a number of times. One would have thought this could not or should not have been happening. The explanation Varoufakis would provide for this is that the political sphere has been swallowed up by the economic sphere, a scenario in which corporations rule the world in a democracy-free zone. Though he doesn’t say this, one could conclude from this perspective that democracy is for the “little people”, while the rich and the multinational corporations can do whatever they want (an example of which is TTIP) with politicians as their servants rather than their regulators. In such an environment, could one be forgiven for wanting to be rich, even thoughtlessly so? The Flint problem is much worse and nightmarish than people realizes. If politicians and media weren’t working hard to hide the real magnitude of the problem, the whole population would have to be displaced to a liveable place. Lead poisoning will destroy the lives of the population over decades and impose a painful slow death to society over there, but that is much more ‘manageable’ politically and subservient to disaster capitalism than doing what is right for the population right now. Is a repeat of Katrina, but worse even (relatively speaking as the population affected is smaller). This is how the system will (is) collapse (collapsing), slowly degrading over time and the necessary material and social infrastructures are destroyed by greed and corruption. I’m more convinced each day there is no going back and we are assisting to a similar scenario of that of Western Roman Empire back in the day and returning to feudalism. Meanwhile most of our politicians here at home just try to foist blame for a poorly functioning national economy upon the same global economic conditions which they and their globalist corporate cronies have been working like Trojans to create these past several decades. The “unemployment is an individual problem” narratives have already spelt disaster for some conservative governments. Beware though of the devious, hidden within the Liberal ranks, who secretly want this attitude to prevail while never being foolish enough to speak the words in public. When the global economy fails to deliver on the greatest good within the nation, the domestic economy is the only thing left. Money is an excellent and fungible tool enough of which enables and defines freedom in a monetary economy, retail sale is where all costs for any item are terminally summed and the terminal end of the economic/productive process as well, employment is a good purpose but there are many good purposes and the government would be wiser to promote positive purpose than merely employment, and the constituencies of consumers (everyone) and small to medium businesses are massive and have a mutual self interest in having more money available to be spent. “If the unemployed are ultimately dispensable for capitalist production (and that is what persistent long-term unemployment suggests); and they cannot do anything productive if we employ them in the public sector (that is the overwhelming view of the deficit terrorists); and they are a nuisance to manage (you know all the arguments – income support corrupts etc) – then ultimately society might start asking “what is the point of the unemployed?”. If the monetary economy itself exists for the common good (there is every reason to believe it should) and capitalist production is to remain relevant to that economy, then the types of output from the production activity needs to be able to adapt in ways that best serve our economic needs within that frame. It’s been suggested that the need to factor environmental costs into the economic equation should shift our productive output to satisfy the new needs, and yet the capitalist system with it’s existing profit above all corporate mandate will never respond to those needs without an external force regulating it to do so. The entire world would completely turn to S%4! before that happened; either environmentally or socially or both! It’s been a serious oversight on the part of government founders and later lawmakers world wide, to have omitted to define the economy itself in a way that enshrines the common good, democratically defined, as a charter right of all citizens. Production capitalism and it’s political offshoots inability to adapt to changes in a decent manner independently, proves that. I also think that some types of regionalism (in the UK they are now stealing your term and calling it localism) fail because they promote competition with other places rather than cooperation. This is certainly how Tory politicians think it should happen. This manifests itself as less central government involvement (through income sharing), as they think those sorts of arrangements make local government lazy. You see it also in the new powers they have agreed to give Scotland, but with the income sharing element significantly undermined. The situation here in Michigan, including Flint and Detroit, is barely-disguised class warfare. Labor unions here are under attack with Right To Work legislation. Education and services, including water, are headed towards privatization. All these changes are made under the premise of attracting more business and capital to our state, but what’s really happening is that people with the means are now flourishing (and can afford private education, health care, etc.) but those without are struggling and have no help. The public school system in Detroit is under the same emergency manager who oversaw Flint’s water system, and after years of crisis shows no signs of improvement. In two years we elect a new Governor. By then we will see if citizens of Michigan are truly fed up. I neglected to mention that there is an English translation of Forrester’s L’Horreur Economique, and you can obtain it at Amazon. Bill mentioned this in his original article. What is happening is broadly consistent with Marx’s predictions about capitalism. “Marx predicted that the development of capitalism would lead inexorably to the concentration of capital, an immense accumulation of wealth on the one hand and an equal accumulation of poverty, misery and unbearable toil at the other end of the social spectrum.” – Alan Woods. Unfettered capitalism in the the late 18th C and the 19th C showed us how exploitative and ugly capitalism could be. It was characterised by impoverished workers, child labour and slavery with periodic panics and crashes. Capitalism however did revolutionise production and it swept away the remnants of feudalism and mercantilism. In the 20th C after the Great Depression, it appeared labour (meaning only Western labour as an “aristocracy of labour” granted privileges with the spoils of Imperialism) could come to an accommodation with capital. Government intervention ensured high taxes on capital and introduced the welfare state along with greater pay, rights and conditions for workers. Capitalism appeared unstoppable with state regulation to stabilise it and guarantee workers’ rights. Since about 1970, the internal contradictions of capitalism have been breaking out once more. Again, we see the inexorable tendency to the concentration of capital, “an immense accumulation of wealth on the one hand” and the return of immiseration at the other end of the social spectrum. Marx WAS and IS right. MMT on its own can do little or nothing to correct or counter the deeper problems of capitalism. Under capitalist economic and power relations, MMT policies will almost certainly never be implemented. If MMT could be implemented, it would provide symptomatic relief for some of capitalism’s effects as welfarism has done. However it does not address the aetiology of economic ills under capitalism. The central problem is capitalism itself. Social evolution must precede political evolution which must in turn precede economic evolution. I can’t offer more because the theory is very long and this blog is not my soapbox. I simply caution that MMT will gain no traction under the current conditions of political economy, the essential components of which are ownership of the means of production and the power to distribute its output. I was born and raised in Flint but have lived in NY for many years, I always tell people that Flint is the future. Your post confirms it. Your Austrailianess is showing: Flint bought water from Detroit, not Denver. Denver is 1200 miles away…. Thanks for pointing out my typo. My notes tell me it was Detroit but I must have been thinking about something else and typed Denver by mistake. I understand the distances involved. I don’t have much to say other than China has a currency issuing government and will be able to meet all its liabilities denominated in that currency. I know there are claims the Chinese central bank will go broke but that should be rejected outright. It can never go broke. I know we don’t agree with Paul Krugman’s economics persay but he did a good piece on the ideology of the right wing behind these crimes against humanity (sadly mostly black poor people) in the USA. It’s criminal what this governor has done. Sadly I think it fits in with dumbing down the voters even if neurotoxins like lead are required. Jason H, what this really fits in with is the use of a divide an conquer strategy being applied domestically in support of a policy of carrying on a struggle for global hegemony. A poor, mostly black community doesn’t have much political clout, and their bleats are least likely to cause a stir. From MMT principles, we know that the US government could in theory, shift it’s foreign policy in favor of increasing the” budget” for domestic infrastructure, and domestic economy rebuilding from it’s militaristic activity in support of empire expansion abroad, even without removing what we know to be an artificial congressional “budget constraint”. The big problem is it would mean a massive shift in real resources and abandoning the imperialist aspirations of the global oligarchy that appears to decide much of US policy. Austerity by way of balanced budget thinking in what have been deemed by some to have become US vassal states is leaving lot’s of US dollars available in their reserves to as Prof Michael Hudson suggests purchase US treasury instruments which adds more fuel for global military/ economic expansion. In essence we are all suffering global austerity in order to finance a power grab by a dictatorial oligarchy, which as former president Jimmy Carter informs us, has replaced democracy. This would explain why no politician anywhere in the west publicly acknowledges the reality of MMT; that the only constraints are real resources and political will. I’m not an expert on geopolitics, so I don’t know what the risk of retracting all the military bases would be. What I do know is that the case for this trade off between prosperity at home and military expansion abroad has to be transparent, truthful and justifiable in a democracy. In Krugman’s column that you link to, He makes a false contrast between Liberals and conservatives, claiming that there is no right answer because it is a question of values. The contrast is false because, although it is a question of values whether one helps the poor or allows people to keep their hard-earned income, a society can do both without either losing out. The false presupposition behind K’s contentious contention is that taxes are needed to help the poor through government spending and that more for one thereby means less for the other. You are correct. The trade-off would be beneficial. Resources put to failed war-making could all be put into reconstructing the USA’s badly degraded infrastructure and putting its poor back to work with living wages. Geostrategist, John Mearsheimer, has elucidated a clear theory which demonstrates that the USA would be more prosperous and just as secure by being content with being a hemispheric hegemon not a global hegemon. Mearsheimer is an “offensive realist”. He does not pretend that any large nation will cease to maintain massive war preparedness and indulge in arms races. However, he argues that the USA overextends itself and wastes lives, money and material in trying to dominate the whole globe when hemispheric dominance would bring it all the same guarantees of security, insofar as security can ever be guaranteed. The USA has no need to dominate the Middle East, for example. It is clear that the world’s nations must cease coal and oil burning if we are to prevent dangerous global warming. If enough nations realise this and switch away from fossil fuels, then oil ceases to have strategic value for civilian economies. The USA is well positioned to run a renewable energy economy with its ample sun and wind resources. Oil may continue to be a strategic need to run a military for quite some time. Again, the USA has enough oil for that purpose if it ceases civilian use of oil. In any case, possessing a large offensive nuclear arsenal effectively renders a nation invulnerable to attack unless the attacker wants to cease to exist. The USA, Russia and West Europe are essentially invulnerable in this sense. China is approaching that status. In summary, there are serious costs and no real benefits to the USA’s global stance. A hemispheric stance would suffice. This raises a point, I remember having read, at least one US general has raised in the past; that no invading force could overtake the US on it’s own soil were it to simply take a posture of limiting it’s military resources to the defensive purposes. Yes, the US also has enough energy and other resources, including an inventive society, within national borders to successfully make the transition to a sustainable green domestic economy. Good trade relations within the hemisphere can be assured given fair terms between respected sovereign trading partners. This makes the probability of long term success even greater. National security cannot be the underlying reason for global interventionism on the scale we are witnessing, and it would not bode well for life in the broader Americas hemisphere if the forces driving that shifted to exercising “hemispheric hegemony” using similar tactics with the same goals. There is a peace dividend to distribute globally if we can find ways to preclude the possibility of anyone exercising hegemonic ambitions by eliminating offensive positions, and most importantly first strike weapons, and, by openly adopting strong defensive positions. This was partially achieved in 1990 and then slowly unraveled by US neo con/neo libs. This group and those who control them, with their stated goal of exercising hegemony, have set back the global peace process many decades and this may well have sealed the fate of humanity already.